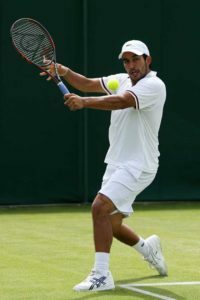 Filipino Treat Huey and Belarusian Max Mirnyi beat Spain’s Pablo Carreno Busta and Guillermo Garcia-Lopez, 6-3, 7(7) – 6(5), in Round 1 of the prestigious Wimbledon Championship on Thursday (Friday in Manila) at the All England Lawn Tennis Croquet Club in London. Huey and his partner took advantage of their opponent’s error in Game 12 to force a tie breaking match in the men’s double event. The duo of Busta and Lopez initially took the lead in the deciding set, 1-0, but the Huey-Myrnyi tandem retaliated forcing their foes to commit a backhand error, resulting in a 2-4, victory. The Mirnyi-Huey tandem is seeded 12th in the tournament. Huey and Mirnyi is set to face Brazilian Marcelo Demoliner and Pakistani Aisam Qureshi in Round 2. Before playing in Wimbledon, Huey and Mirnyi reached the quarterfinals of the 2016 Aegon Open Nottingham. They also won the Mexican Open against German Philipp Petzschner and Austrian Alexander Peya, 7-6 (7-5), 6-3, on February 27.